A CLASSIC, ICONIC AND LUXURIOUS LOUNGER IN ALLURING VIBRANCY With AHNDA, Stephen Burks has a created another DEDON first — an outdoor lounger with all of the iconic style, ergonomic comfort and luxurious attention to detail that one expects of the finest indoor pieces. 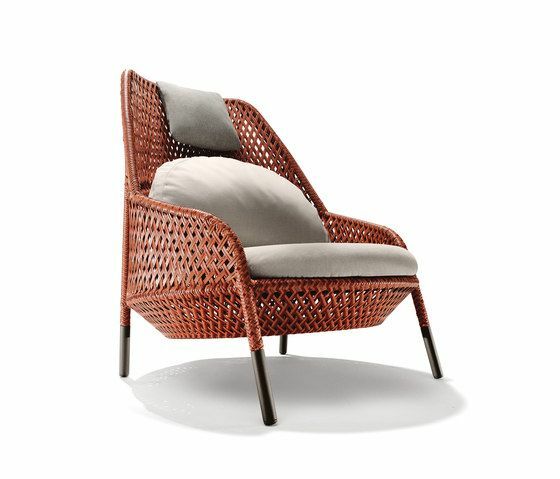 Available in wingback and lounge chair versions, AHNDA strikes you immediately with its looks, the designer having immersed himself in the rich weaving culture of the Philippines to develop the chair’s signature open weave. Created with weatherproof DEDON fiber, this ‘transparent upholstery’ conveys a feeling of breezy lightness, while ANDHA’s articulated structure, clearly visible underneath, signals a fresh approach to classic lounger design. As you inspect it more closely, AHNDA reveals a level of detail typically associated with a collector’s piece. Knurling on the reinforced aluminum legs, for example, echoes AHNDA’s signature woven pattern, as does a zig-zag stitch on the headrest. A stunning example of the craftsmanship of DEDON’s master weavers, the woven pattern itself consists of three shades of red fiber, giving AHNDA a subtle yet alluring vibrancy. But it’s not until you sit in this chair that you appreciate what a groundbreaking piece of outdoor furniture it is. With a seat design based on the circle, AHNDA is perfect for curling up, sprawling out or lying back with your feet up. The posture is inclined enough for relaxation but upright enough for conversation with and connection to others. Unique featured cushions, including an embracing backrest and 2-height headrest, ensure luxurious levels of ‘indoor’ comfort, all in a chair designed to resist the harshest of weather conditions. An optional AHNDA footstool features the same open-weave pattern and circular design motif as the wingback and lounge chairs. The footstool is also available as a coffee table with a top of tempered glass, coated on one side in bright red.